Some lighter news today. The Huffington Post reports on an planet about 4.5 times as massive as Earth in orbit around an M Star, just 22 light years away, in the Goldilocks zone, with the likelihood of mild temperatures, more or less like Earth’s, on a solid or water surface. The star is part of a tertiary system, but the other two stars are far enough away not to seriously affect the climate. 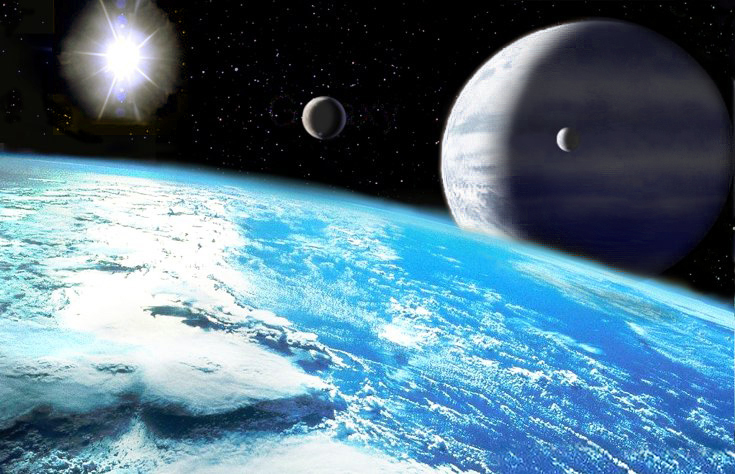 A larger planet could have a thicker atmosphere and be warmer than expected. It could be subject to runaway greenhouse problems like Venus. The planet is likely to be in a tidal lock, with one side facing its “Sun”, meaning that the mildest and steadiest temperatures would occur in an annular twilight area. Inhabitants would experience perpetual twilight. Such a planet might not have a strong magnetic field and be subject to solar storms, which tend to be large from M Stars. That argues against life. But a thick enough atmosphere with the right stuff might provide some protection. The M Star is likely to be much older than the Sun, which would mean life has had more time to evolve. The star is GJ667C, whereas before the star Gliese was getting the attention. The link (and video) are here. An annular civilization would be likely to have unusual politics, and probably not very democratic. Stephen Hawking has warned that our broadcasting ourselves just could be met by hostile visitors. If the visitors from a planet like this (who would now see the Earth as it was in 1990, not so long ago) get better wind of what’s happening here as they approach, they’re likely to be more interested in meeting Mark Zuckerberg than President Obama. Would societies on other planets have social media? James Cameron, in “Avatar”, imagined that the tall people on Pandora had a biologically grown Internet with a kind of telepathic form of Facebook. I think that’s pretty reasonable. But people might be segmented into communities that can communicate internally. Technology might exist that could reach the star physically in about 35 years. A civilization on this planet might be able to survive solar blasts by scurrying to the dark side (which would warm up) during solar storms. That means it's infrastructure in the annular zone would have to be robust, and it would have to "spend" a lot on hardened infrastructure regardless of its planetary political climate. This observation, rather Obama-esque, could bode well for infrastructure spending on Earth (especially against space weather).